Personal info and history about the Ibiza villa rental with breathtaking sea views. Then "Wu Wei" is the choice! We are the proud owners of a fabulous Spanish villa "Wu Wei", situated at the wonderful island of Ibiza. For the name of the villa we got our inspiration in 'Taoism', it means 'action without action'. Whilst staying in our fantastic villa, you can just enjoy and relax, but you do not have to do anything for it. The villa is an oasis of peace where you can escape the stress of daily life, to chillout with at the background an unbelievable land- and seascape with enchanting Ibiza sunsets and sunrises. The Spanish villa is situated on a hill with extraordinary views to the Northwest of the Mediterrenean Sea, called the San Vicente bay. Cala San Vicente is in the Northeast of the island, at approx 25 min driving from Ibiza town and about 15 min to the nearest Ibiza golf course. The villa itself, is surrounded by a natural garden of more than 5,000m2 (approx 1.5 acres) and to the left and right there is a wildlife zone of 40,000m2 (10 acres). With only higher and lower on the mountain some neighbors. It is just an oasis of peace and quiet. 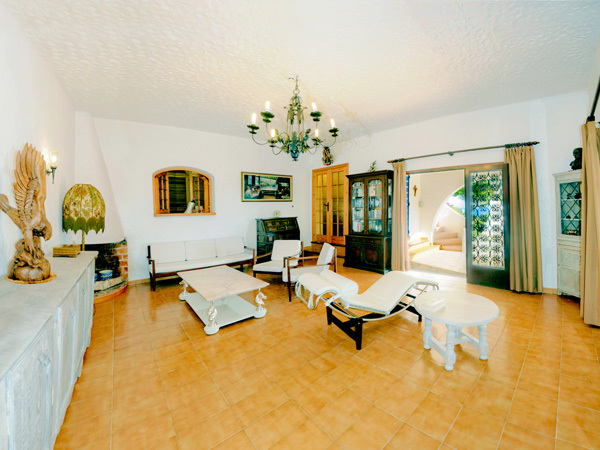 We offer this Ibiza rental villa for many years and have received many positive reactions that you can read on Zoover. The smiling faces on our page Happy People is more than what words can describe, a stay in our Spanish villa is just fun! Do you want to view before renting? If you are in Spain or even closer on the island of Ibiza and you would like to see what we offer, you can always contact us for an appointment, but I hope you will understand that we have to respect the privacy of our clients (if the villa is occupied). The address of our villa is not shown on our website for these particular reasons. We believe you also, would appreciate privacy and peace, when you would be renting the villa. Our clients always comment that the images on the website have given them a clear understanding of the different rooms and outdoor space, and feel very familiar with the surroundings when they arrive. Please click on the images on the side of the 'window frame' to see the different parts of the villa. We are on Facebook and have a profile 'Cala San Vicente' , you are welcome to join this fast growing group. There you can view more photographs, video's and popular hotspots of the Cala san Vicente area. The Spanish authorities really do their uppermost to fight fraud, in the world of Tourism, and so they should. Since a few years it is illegal in the Balearic Islands to offer property for rent for a short period (1 to 3 weeks) WITHOUT the official rental licence. 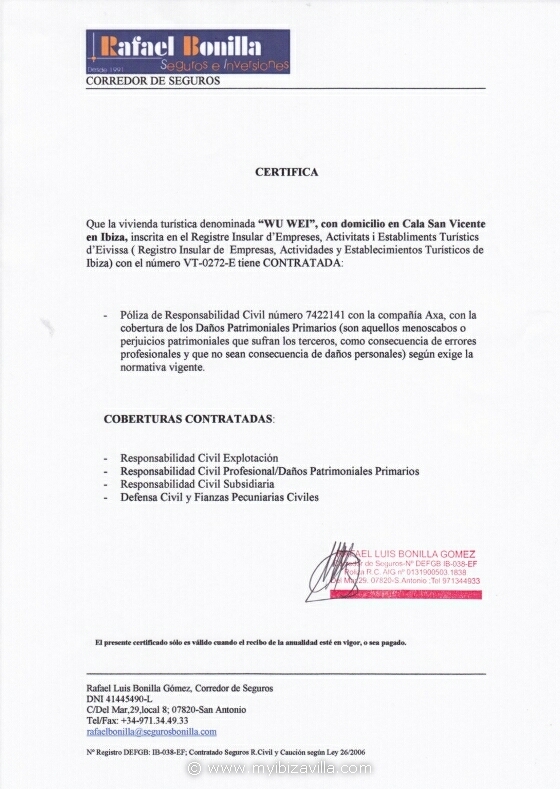 We have a licence number VT-0272-E, issued by the Tourism Association of Ibiza. 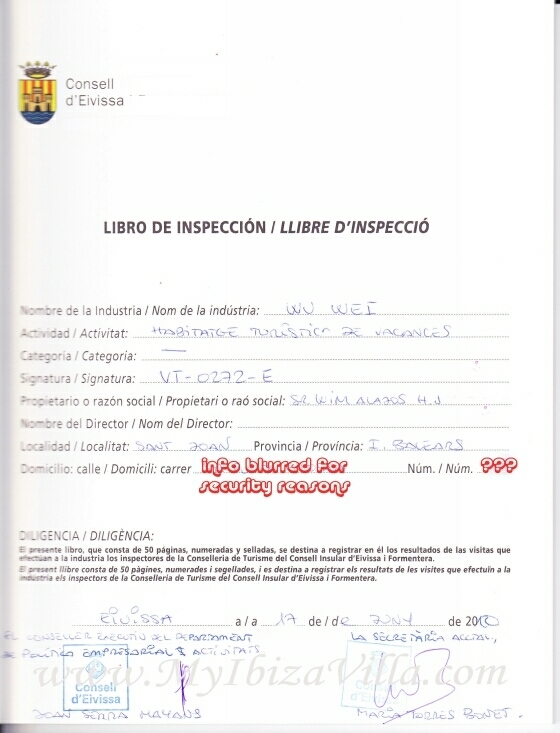 This number is registered with "Tourism-Ibiza and Formentera". 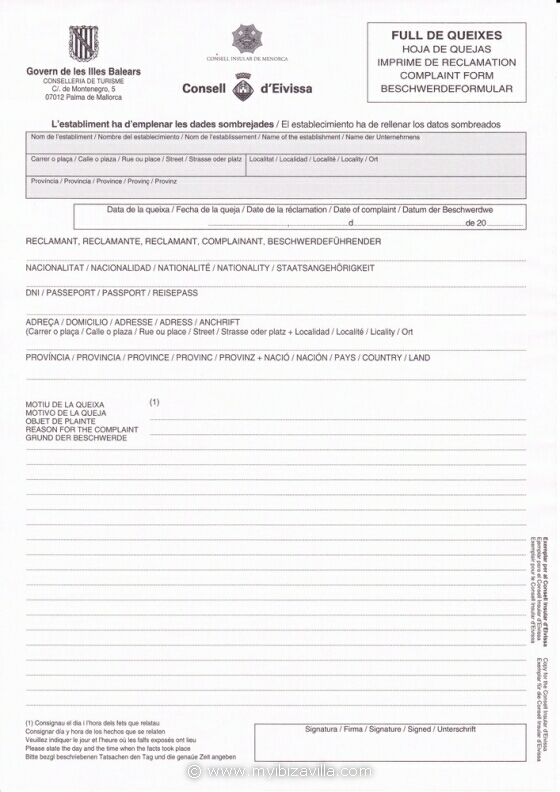 And like in any hotel, there will be a Complaints Form of the Consulate for Tourism to hand, but we can guarantee that none of our clients have ever needed to use this Form. Guarantee that your payments are secure. 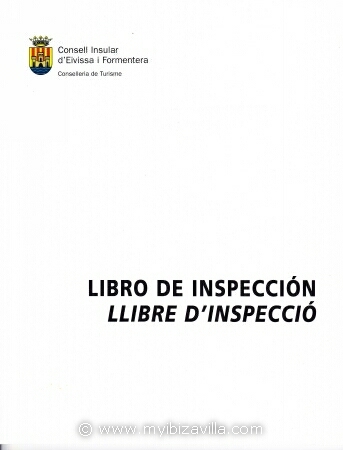 This Spanish villa had a full check-over and is adapted to the required standards by the Tourist Inspector and has obtained an inspection booklet for yearly check-ups. 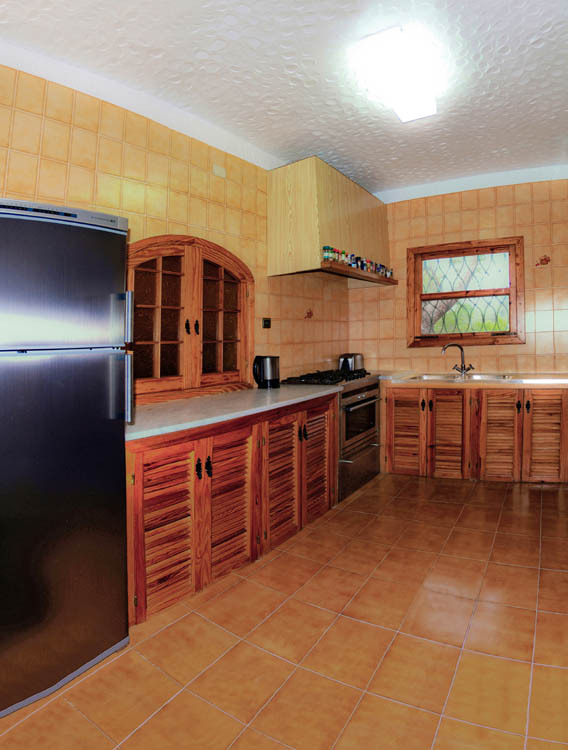 This villa is equipped to guarantee the safety for the tenants, especially children. Each room or open space has its own fire alarm which is, as the security system, connected to the central computer of the security company and the local police. We, as owners, will also be notified immediately by automatic telephonic message. The highly user-friendly security alarm keeps unwelcome intruders at bay. This way we try to guarantee you a problem and stress-free holiday. Available periods can be checked on Ebay. Any other questions will be answered with pleasure, by contacting us via the contact form on this site. We try to accommodate you as much as possible, in your search to that special holiday on Ibiza. This official complain document you will receive together with the keys of the Villa. We certainly do not wish for you to experience holiday problems. but you must have heard of very unpleasant situations like double bookings or villas/houses which are so badly damaged that they are just not suitable anymore to rent out. This could be the case if there is a bush fire, like in Beniras in 2010, where several acres (with houses) were burned down. Physical or material damage due to a villa/house in bad state of repair, could also happen. Without insurance your holiday could be ruined. As official license holders, we are obliged to have an insurance for all eventualities. Because pictures say more than a 1000 words ...Click on the pictures to take a look inside the villa.